One may find that the new ribbon-style interface of Microsoft Visio 2010 puts all the users who were accustomed to Microsoft Visio 2003/2007 into a fair amount of confusion. A well-designed application, Classic Menu for Microsoft Visio 2010, comes to solve the problem. The application helps bring back the classic-style of Microsoft Visio 2003 and 2007 interface with all the new features of Microsoft Visio 2010, which allows users to seamlessly switch between the two interfaces. 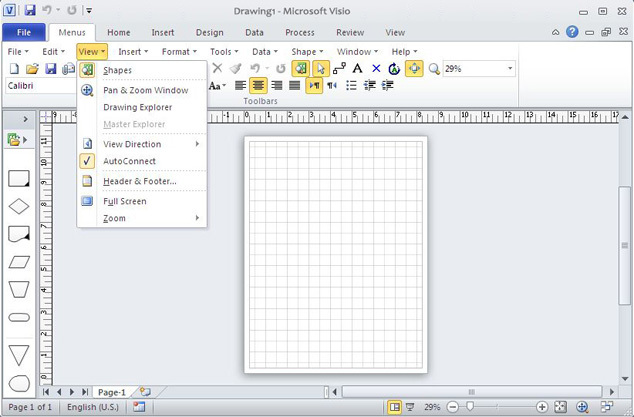 The software allows you to work with Visio 2010 as if it were Visio 2003/2007. It shows the familiar classic menus and toolbars on the ribbon in Microsoft Visio 2010. If you were using Visio 2003/2007/XP/2000 before, you don't need any trainings or tutorials after upgrading to Microsoft Visio 2010 with this add-in now. All classic menu items are well displayed as a group in the tool bar of the Ribbon, while all new features and commands of Microsoft Visio 2010 are added to the classic style interface. Classic Menu for Microsoft Visio 2010 is ideal for international organizations as it supports all the languages of Microsoft Visio 2010 including English, French, German, Italian, Spanish, Portuguese, Japanese, Dutch, Chinese, and more. It automatically shows the menus and toolbars in the language of your Microsoft Office 2010. Fully compatible with Windows 7, Windows 7 x64, Vista, Vista x64, XP, XP x64, Windows 2003 Server and 2008 Server. Combine 32-bit and 64-bit Classic Menu into one single Exe installation package, so that users don't need to know whether they are using 32-bit or 64-bit of Microsoft Office 2010. You can enable or disable the classic menu and toolbar in an easy way. And the Classic Menu Manage center can help you quickly configure the setting. BatchSpellChecker is a code-aware batch spell-checking software. It performs search in the specified folder, displays the list of the files containing the misprints, and allows you to correct the errors and save the changes. Create, share and print personalized photo books, calendars, greeting cards & invitations, collage enlargements and passport photos. CamtoPrint allows you to fully customize your creation and share it with your friends & family via FaceBook. Autopano Pro is the 1st software to automatically detect photos belonging to a panorama, the 1st to really correct color and exposure variations, the 1st to perform HDR stitching from bracketed images. Autopano Pro is incredibly fast and efficient. Make your own photomosaics in minutes! The new photomosaic maker software will produce stunning mosaics out of ordinary photos. Create exclusive posters and stunning photomosaics in minutes! CheatBook (06/2010) - Issue June 2010 - A Cheat-Code Tracker with Hints, Tips, Tricks for several popular PC Action and Adventure Games. 188 PC Games, 20 Walkthroughs for PC and 14 Console Cheats are represented in this new version. This site does not contain serial number, crack, keygen Classic Menu for Visio 2010 serial number : serial number is the simplest type of crack. A serial number(cdkey,product key,etc) is register the program as you may already know. a crack or keygen may contain harmful software. If you cannot find the exact version you want, just give it a try. for more information read .nfo/.txt/.diz file include in zipped file.